Tumor necrosis factor (TNF) is a major mediator of apoptosis as well as inflammation and immunity, and it has been implicated in the pathogenesis of a wide spectrum of human diseases, including sepsis, diabetes, cancer, osteoporosis, multiple sclerosis, rheumatoid arthritis, and inflammatory bowel diseases. TNF-α is a 17-kDa protein consisting of 157 amino acids that is a homotrimer in solution. In humans, the gene is mapped to chromosome 6. Its bioactivity is mainly regulated by soluble TNF-α–binding receptors. TNF-α is mainly produced by activated macrophages, T lymphocytes, and natural killer cells. Lower expression is known for a variety of other cells, including fibroblasts, smooth muscle cells, and tumor cells. In cells, TNF-α is synthesized as pro-TNF (26 kDa), which is membrane-bound and is released upon cleavage of its pro domain by TNF-converting enzyme (TACE). 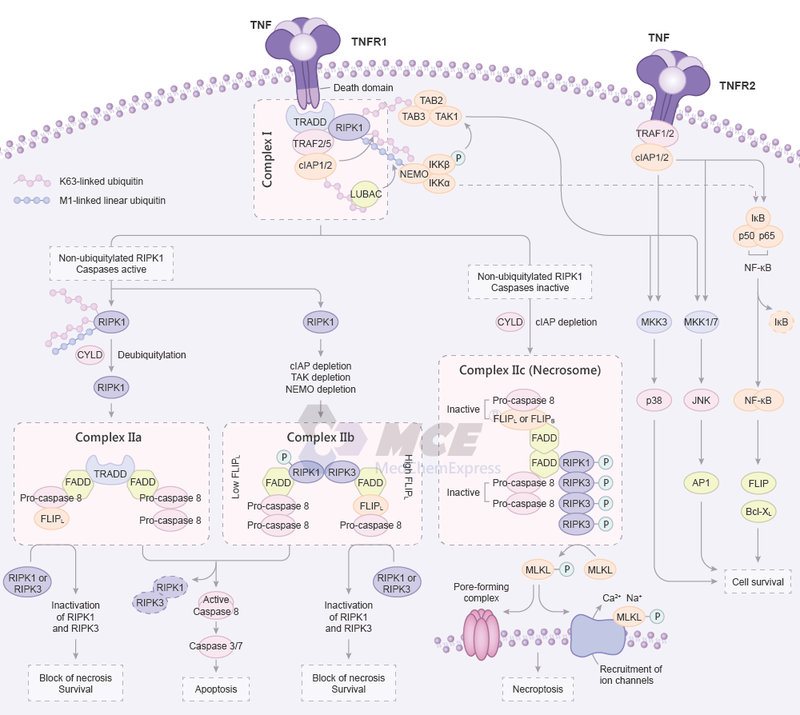 Many of the TNF-induced cellular responses are mediated by either one of the two TNF receptors, TNF-R1 and TNF-R2, both of which belong to the TNF receptor super-family. In response to TNF treatment, the transcription factor NF-κB and MAP kinases, including ERK, p38 and JNK, are activated in most types of cells and, in some cases, apoptosis or necrosis could also be induced. However, induction of apoptosis or necrosis is mainly achieved through TNFR1, which is also known as a death receptor. Activation of the NF-κB and MAPKs plays an important role in the induction of many cytokines and immune-regulatory proteins and is pivotal for many inflammatory responses. Following the binding of TNF to TNF receptors, TNFR1 binds to TRADD, which recruits RIPK1, TRAF2/5 and cIAP1/2 to form TNFR1 signaling complex I; TNFR2 binds to TRAF1/2 directly to recruit cIAP1/2. Both cIAP1 and cIAP2 are E3 ubiquitin ligases that add K63 linked polyubiquitin chains to RIPK1 and other components of the signaling complex. The ubiquitin ligase activity of the cIAPs is needed to recruit the LUBAC, which adds M1 linked linear polyubiquitin chains to RIPK1. K63 polyubiquitylated RIPK1 recruits TAB2, TAB3 and TAK1, which activate signaling mediated by JNK and p38, as well as the IκB kinase complex. The IKK complex then activates NF-κB signaling, which leads to the transcription of anti-apoptotic factors-such as FLIP and Bcl-XL-that promote cell survival. The formation of TNFR1 complex IIa and complex IIb depends on non-ubiquitylated RIPK1. For the formation of complex IIa, ubiquitylated RIPK1 in complex I is deubiquitylated by CYLD. This deubiquitylated RIPK1 dissociates from the membrane-bound complex and moves into the cytosol, where it interacts with TRADD, FADD, Pro-caspase 8 and FLIPL to form complex IIa. By contrast, complex IIb is formed when the RIPK1 in complex I is not ubiquitylated owing to conditions that have resulted in the depletion of cIAPs, which normally ubiquitylate RIPK1. This non-ubiquitylated RIPK1 dissociates from complex I, moves into the cytosol, and assembles with FADD, Pro-caspase 8, FLIPL and RIPK3 (but not TRADD) to form complex IIb. For either complex IIa or complex IIb to prevent necroptosis, both RIPK1 and RIPK3 must be inactivated by the cleavage activity of the Pro-caspase 8-FLIPL heterodimer or fully activated caspase 8. The Pro-caspase 8 homodimer generates active Caspase 8, which is released from complex IIa and complex IIb. This active Caspase 8 then carries out cleavage reactions to activate downstream executioner caspases and thus induce classical apoptosis. Formation of the complex IIc (necrosome) is initiated either by RIPK1 deubiquitylation mediated by CYLD or by RIPK1 non-ubiquitylation due to depletion of cIAPs, similar to complex IIa and complex IIb formation. RIPK1 recruits numerous RIPK3 molecules. They come together to form amyloid microfilaments called necrosomes. Activated RIPK3 phosphorylates and recruits MLKL, eventually leading to the formation of a supramolecular protein complex at the plasma membrane and necroptosis .
. Conrad M, et al. Regulated necrosis: disease relevance and therapeutic opportunities.Nat Rev Drug Discov. 2016 May;15(5):348-66.